Nightlife (Small) – 11mm by 1.8m: Suitable for Yorkie, Chihuahuah, Maltese. Snake (Medium) – 16mm by 1.4m: Suitable for Pug, Jack Russell, Terriers. 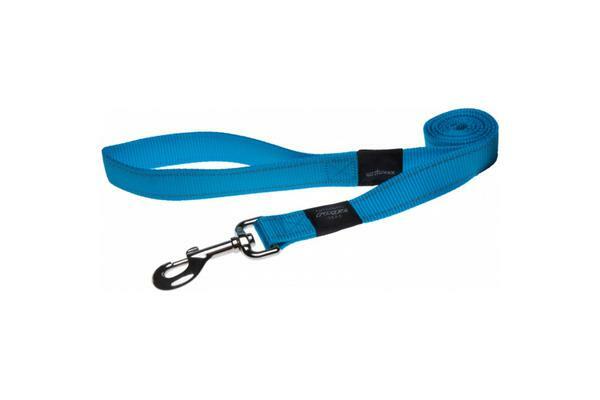 Fanbelt (Large) – 20mm by 1.4m: Suitable for Dalmation, Spaniel, Boxer. Lumberjack (XL) – 25mm by 1.8m: Suitable for Rottwiler, Ridgeback, Labrador. The Rogz Dog Lead Turquoise is also available in pink,, purple,, red,, black and blue. Rogz is a South African company that manufactures and distributes a wide range of pet accessories. Their specialties include collars, leads, harnesses, toys, beds, id tags and bowls. Rogz strives to stay ahead of the pack and is one of the world’s most enjoyed and respected pet brands! Want to add a bit of variety to your dog’s wardrobe? We have TippyTap Bow Tie dog collars available and look very cute!